This story began Monday evening, April 9, 2018. My niece, and two of her daughters were driving home from a school awards program when a small black dog walked out in the middle of the street in front of them. They stopped, got out and asked a man that was nearby if he knew anything about the dog. He did not – said it just roams around but he had no idea where or if it belonged to anyone. It was in an unbelievable shape. They wrapped her in a blanket and brought her to my house. Upon looking at her, I thought she had about 20 tumors all over her body. 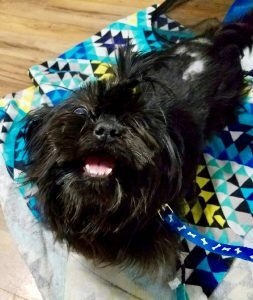 She was a small, solid black shih tzu but looked as though to have many more than four legs! I’d never seen anything like this. After further investigation, all the “tumors” were tennis ball sized matted hair balls that this poor dog has been carrying around for a long time. It was absolutely unbelievable that anyone would let a dog get into this shape. We put her in the tub and after about 3 minutes, the water was muddy brown. There’s no telling when or if she’d ever had a bath. I got my scissors and clippers and cut off as much as I could – which filled a kitchen-size garbage bag half full of hair. I could not get anywhere near all cut off. My clippers were not powerful enough. She was covered in fleas and we found several ticks. We called my sister, who’s pet of 15 years passed away a couple of months ago, to see if she would like to rescue this dog. She immediately drove to my house (45 minute drive) to pick up the dog. She is the sweetest little thing – starved and dehydrated – and very loving. She went to the vet April 10th, 2018 and we found out that Dixie Lue (this sweet baby’s new name) has heartworms, hookworms, and lyme disease. We were all upset at the news. Now, to share a little information about my sister….She is on disability and does not presently work after 30+ years in the nursing field. Her husband, has recently had to have a leg amputated and is immobile at home. Having a pet provides a lot of positives to them. However, because of the many medical issues they’ve had, they cannot financially provide this treatment necessary for Dixie Lue. They want to keep her – of course they became attached to her the minute they saw her and found out her situation. I’m just trying to help them find some financial assistance so they can continue to care for Dixie Lue and help her live a life that all pets deserve – a loving home with loving owners.